If you're reading this then I'm guessing you're ready to change something about the way you are currently eating? Something you're doing is just no longer working for you. So congratulations on taking this step. Just know that many people don't even make it this far. ready to take back control of your eating once and for all? • Discover the 7 steps you need to take to help you say goodbye to overeating for good! • Untangle your emotions from the food you eat, and learn how to know when you're really hungry, or whether you're actually just hungry for something else. • Find out why mindful eating begins with your shopping list, and why preparing ahead of time is the key to health and nourishing choices. 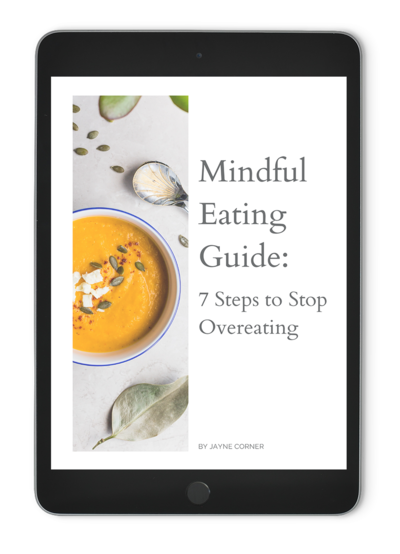 A welcome email is on its way from me to your inbox and it contains a link to your free Guide, Mindful Eating: 7 Ways to Stop Overeating. You’ll also get additional updates and freebies in your inbox. Don’t like it? You can unsubscribe in a click. Jayne’s approach is great! I always felt really positive after each session and loved that I could dedicate that time to focus 100% on myself. My name is Jayne, and as a Clinical Hypnotherapist, Certified Wellness Coach, and Wellbeing Expert, I'm passionate about helping you to understand and change your behaviour around processed food and sugar. After overcoming my own health challenges as a teenager and young adult, I'm here to show you how to regain your life, your proper weight, and your health.